That my friend is how this crazy running story started. I learned so much about myself over the past two years - I always thought of myself as a competitive person. Once I started running, I realized quickly that wasn't the case. So many runners compare themselves to others. Yet I cannot tell you a single one of my friends PR's (personal records) and I just don't care. I am not out there running for anyone other than myself. If I don't meet my goal, at least I finish with my chin up and a huge smile on my face - that is what matters most. You run for yourself, not for others. Now, if you told me two years ago that I would be sitting here today writing this post, I would laugh to the point you would have to commit me. Even when Gabe's aunt ran Boston in 2012, we both stated how nuts a full marathon was and mapped out the 26.2 miles on the interstate. Today, we are both marathoners. I AM A MARATHONER. Now I am crying again after writing those words...thanks. 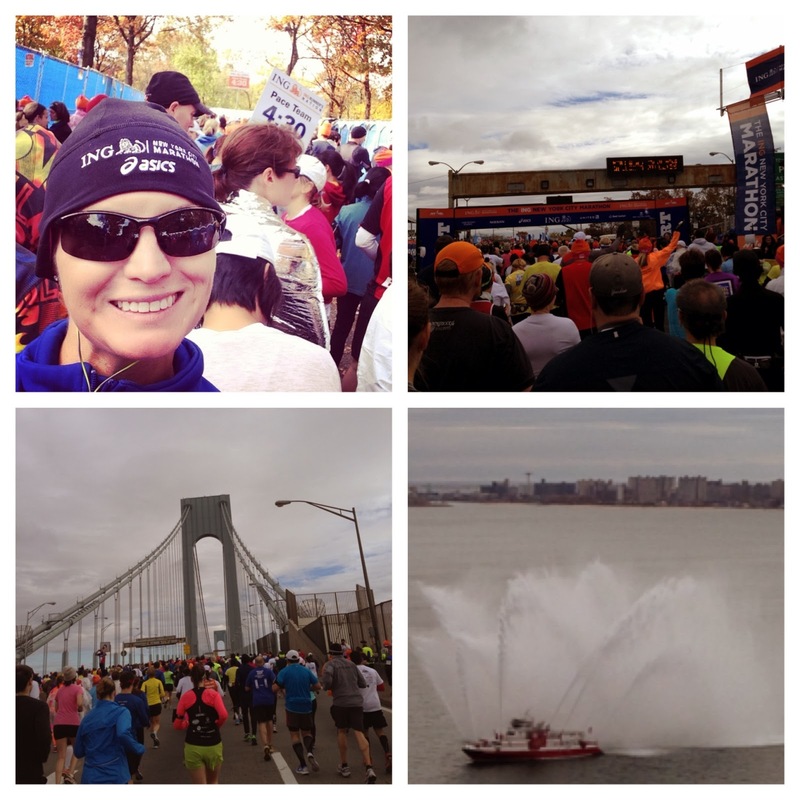 The day I received the marathon lottery acceptance to the ING NYC MARATHON, I was on cloud 9. Then 3 weeks later, I got engaged. Cloud 9 x 10000! Add that to the FL summer, constant rain, crazy humidity - get the picture? I made excuses not to do long runs. I made a lot of them over the course of 5 months. 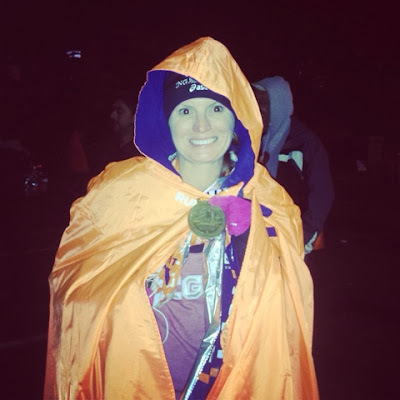 Next thing I know, we were boarding a flight to NY and if you follow this blog, you know something has been missing over the past 5 months......my Marathon training updates. PS - I broke up with my Garmin the night before the marathon and ran with no timing device. It was the best thing that happened to me as I had no idea what was going on. Since I was in NYC 2 months ago, I knew ahead of time my phone liked to die within 2 hours of being in the city, so I purchased the Jackery Bar on Amazon, a portable charger that fit in my arm band and saved the day, twice. 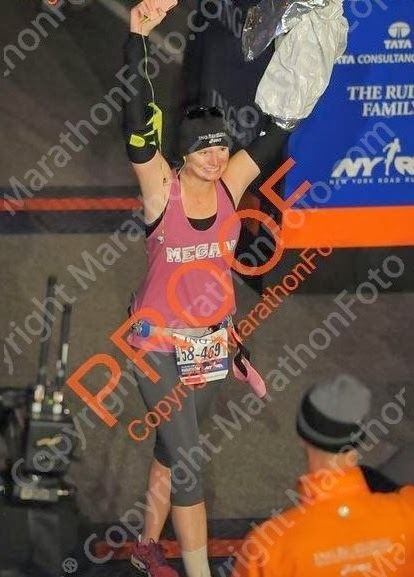 After being pushed through the Wave 4 corrals, listing to Frank Sinatra singing NY NY, I had a huge smile on my face which honestly didn't leave for 26.2 miles. I was freezing, it was windy and I HATE BRIDGES but I was still smiling! I couldn't believe I was about to do this. OH CRAP - Bridge. BRIDGE. I hate this bridge. Did I mention I hate bridges? Get me off this thing....Hello Brooklyn! Oh Brooklyn.....I have never been to your beloved city before. I saw many restaurants I must visit next time in NY. Yet I have to mention, I am not sure when I want to hear the word Brooklyn again! This part of the race seemed to never end. Kidding aside, the locals came out big time and this was such a magical part of this marathon. I rolled my right foot at mile 4 and pushed through. I found gummy bears along the route and even danced to a gospel choir while running. BUT it truly felt like Brooklyn would never end. I found myself at the medic tent at mile 10 to get my ankle wrapped. It's still swollen today but getting better. Hello second Bridge and Playlist. I posted my marathon playlist a week ago. I got a lot of heat from friends, family and loved ones regarding a few emotional songs on the list. I have my future first dance song, my future father daughter dance song w. Hank and even crazier, me and my Daddy's song. My Dad passed away 10 years ago and to this day, our song still makes me cry. People didn't understand why I had James Taylor You've got a Friend on my playlist. One simple answer - I needed my Daddy that day. Or more importantly, I needed to prove to him that I could do this because I know he would be so impressed with me and that is all I wanted while he was alive. Ironically enough, our song started exactly at mile 13 on top of the second bridge overlooking the city. I knew at that point, I would finish the marathon no matter what and my lifelong fear of bridges may be coming to an end! We ran through Queens where I found a Gator. That was fun. 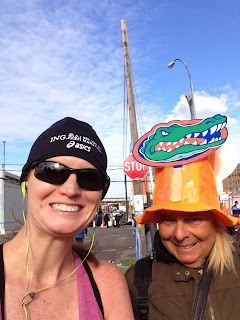 I said Go Gators and she looked at me like I had 10 heads....god knows....To be honest, I don't have much of a memory of Queens of than the Gator cone head but I was very happy to see this lady. I saw her again at mile 23! Then the 59th street bridge happened. 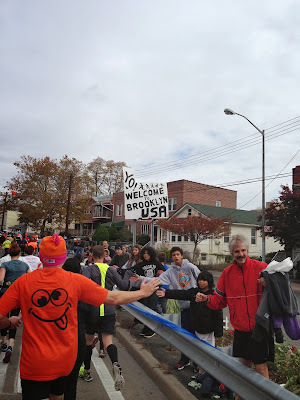 I read everywhere that it was a mental struggle for many runners, going from cheering and screaming crowds to silence.....I hated the fact I would be on a bridge for so long, so I called my fiance and my best friend and talked to them while I walked up the bridge, ending the call when I ran down the bridge. Hello mile 16, we are in NYC!!!!!!!!! I have zero photos from here forward. I saw Gabe in-between mile 16-17. I've never heard had my name screamed more time in my life. I smiled, waved or gave thumbs up to everyone. People were doing Megan cheers on the streets. It was effing AWESOME. I re-vsisted the medic tent at mile 18 to have my ankle re-wrapped. I was in agony......then I sat down and saw many others on cots. I felt awful for them and yelled at my ankle that I had to keep on moving. It felt like 1st Ave would never end. Around mile 20, we ran into the Bronx which was amazing, people everywhere, cheering and handing out food. I LOVE NYC. Then mile 22 happened. I will call it mile 21 1/2 actually because the second I saw mile 22, I thought it should have been mile 23....that the NYC Marathon made a mistake. "Why are we redoing mile 22" I asked to no one. HELLO WALL. From that point forward, I had the biggest mental and physical struggle one could ever encounter. I wanted to quit but refused to do so. I haven't gone 22 miles to walk away with only 4 miles left!!! That would be crazy. Crazier than doing this 26.2 mile encounter. Those four miles were hell. Each one got longer and the weather got colder. The winds got stronger and guess what - night time was settling in. Oh - my ankle, it beyond words and at this point, I was afraid I fractured it. I got through the Eastside of Central Park in the daylight and was met by a parade of police officers with lights while dusk was settling in, way too quick. I knew this was the moment that they were reopening the streets. My goal was to finish before that happened. Public streets reopened 6.5 hours after my wave started. Sure enough, I crossed that finish line at 6:34. Those last 4 minutes were inside of Central Park. Seriously, how happy is this girl!!!!!!!!!!!!!! My phone died at this very second, while posting I DID IT to facebook, LOL. THANK YOU NYC. All of the residents and volunteers made this a race I would do every single year if it were possible. 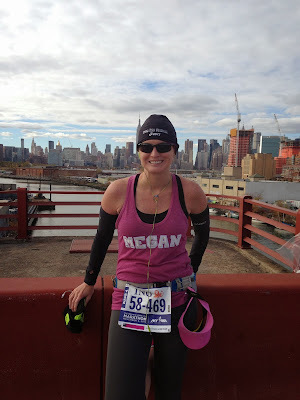 My first marathon experience will never be replaced and it was perfect in every way, with the exception of the wind and my ankle :) I suggest runners to apply for the NYC Marathon lottery. Congratulations!!!! Way to push through. I am so happy for you! What an amazing experience!!! I knew you would finish and love every minute of it! I knew you would enjoy it and finish! What an amazing experience too - great job! Such an inspiration! Awwww I LOVED this post. So many things you said were truly inspirational (and funny too). Really appreciated how important you believe it is to "run for yourself" and not others. I think that's true for almost anything in life. Good for you. I also reeeeealllly loved and got goosebumps reading about James Taylor on your playlist and how it came on at mile 13. That's so touching, Megan. I'm sure your dad was with you that day and was so proud.